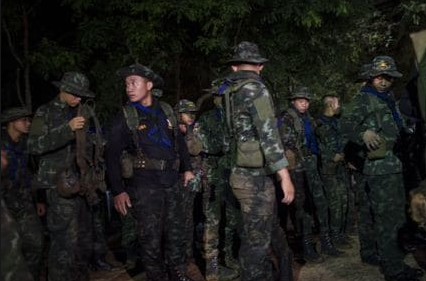 The rescue efforts to get out the trapped 12 young footballers and their coach in Tham Luang cave in northern Thailand suffered a tragic setback on Friday morning, local time when a former Navy Seal taking part in the rescue died during a dive. The fatality is identified as Petty Officer 1st class Saman Kunan, 37, who was a security officer at Suvarnabhumi airport. Saman lost consciousness as he was returning used air tanks to Chamber 3 at about 1 am. His diving buddy tried to save him but failed. Thailand’s King had given instructions for the officer to be given “dignified funeral rites.” His Majesty also ordered that the dead diver’s children be taken care of. Prime Minister Prayut Chan-o-cha has also expressed deep condolences for the loss of Saman. Leaders of the rescue mission were quick to give assurances, however, that as tragic as the Navy seal rescuer’s death is, it will not undermine efforts to rescue the boys. The death underscores the tough challenges and intense risks of the mission to bring out back to safety the trapped boys. The Seal commander maintained that the rescue will continue nonstop until it is complete. The rescue teams are now pumping oxygen into the underground chamber where the young footballers and their coach have been trapped for nearly two weeks already. Officials also issued the warning that at this point, it is still too dangerous to extract the young team through flooded caverns. Earlier, the boys were also given swimming and diving crash courses in case they would need to dive out. Concerns about oxygen have raised new fears about the boys’ safety if they cannot be extracted from the caves before the dreaded monsoon rains this Sunday which rescuers fear could re-fill the cave with floods and reverse whatever gains achieved thus far in the huge rescue effort in recent days.